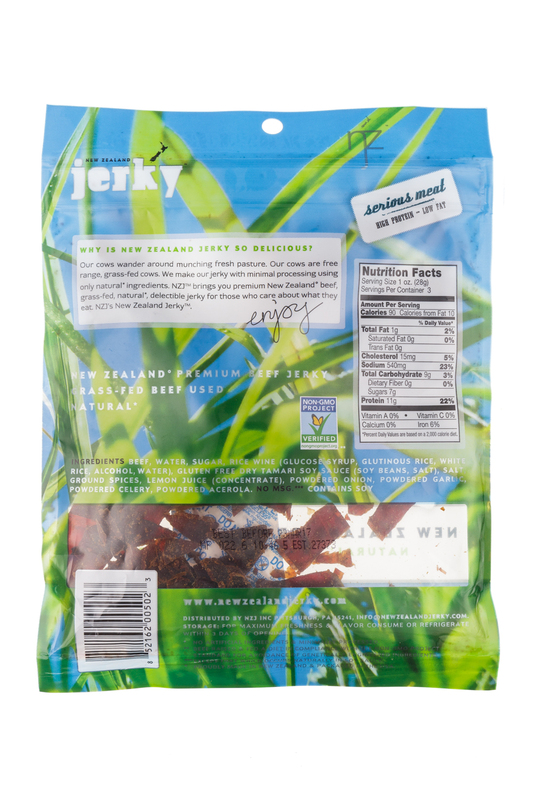 New Zealand Jerky is the First Non-GMO Project Verified Beef Jerky in the U.S. 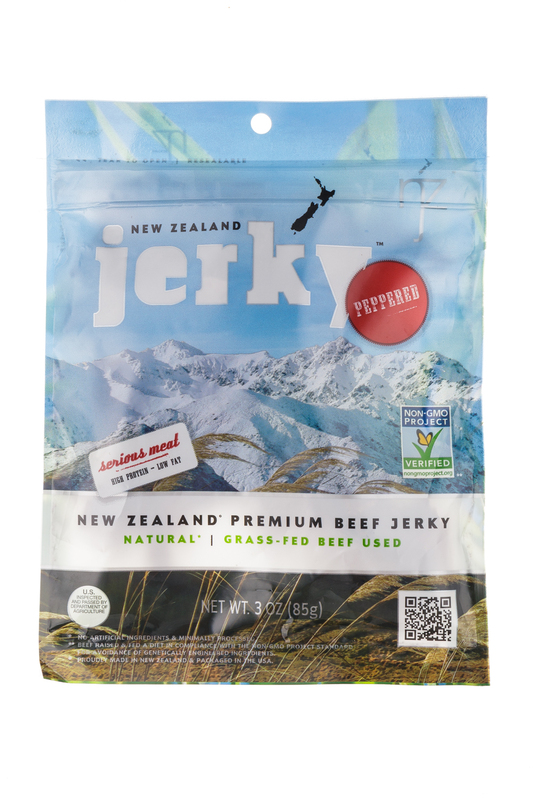 Using Premium, New Zealand Grass-Fed Beef and all Natural Ingredients New Zealand Jerky,is the pioneer of the first Non-GMO Project Verified beef jerky in the U.S., made with premium New Zealand Grass fed Beef and all natural ingredients. 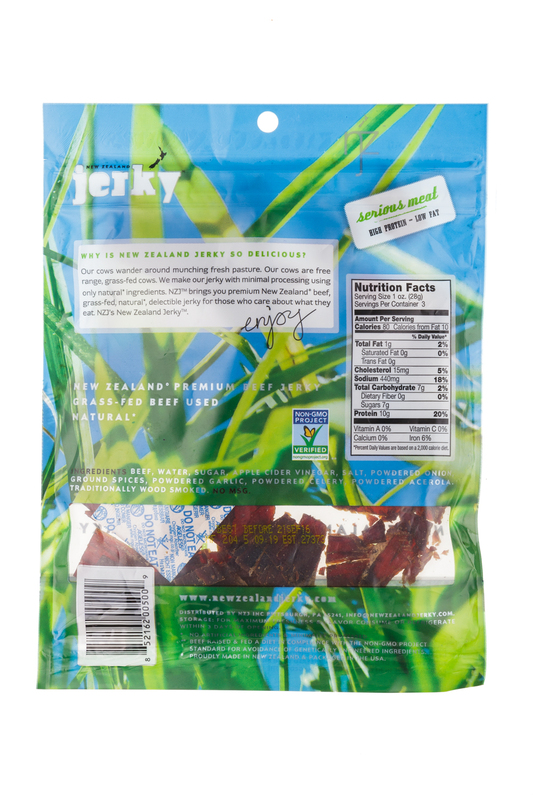 New Zealand Jerky features a lineup of all natural ingredients, beginning with grass-fed whole muscle, top round beef, sliced not too thinly to create a moist, supple texture, to boldly deliver a taste of New Zealand in every bite. The free-range farming practices in the nutrient-rich environment of New Zealand produce an incomparable, high-quality meat that is less fatty, and higher in omega-3 fatty acids than conventional beef. 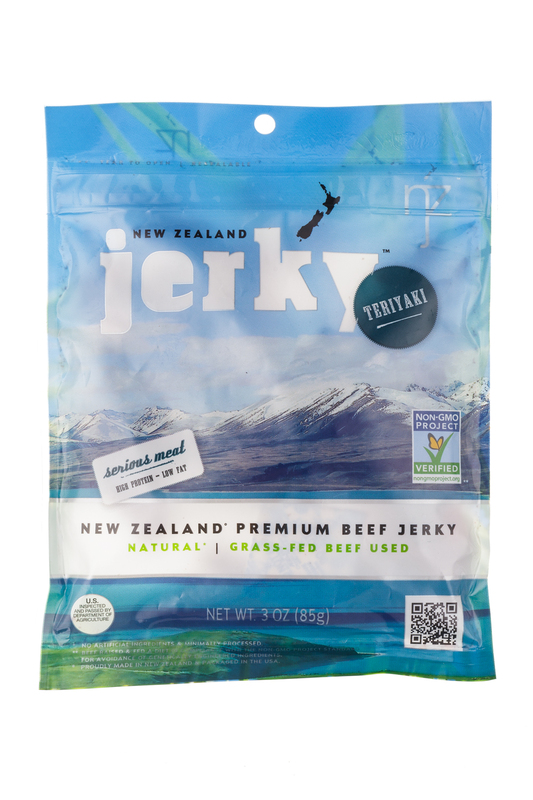 NZJ adds subtle flavor to enhance, rather than disguise, the naturally exquisite taste of its premium grass-fed beef, and is available in three deliciously smoky and savory flavors; Original, Teriyaki and Peppered, All products are lightly marinated with all natural ingredients and traditionally smoked with real manuka wood, NZJ’s subtle use of only natural flavors allows the clean and distinctively meaty taste of its grass-fed beef to triumph. 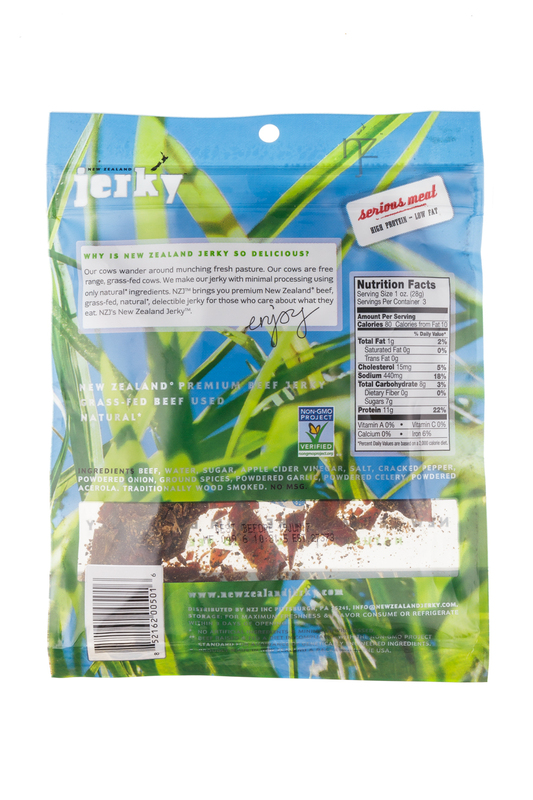 All NZJ jerky products have 30 grams of protein per packet with zero saturated fat, are gluten free, and are made without any additives, preservatives, MSG or nitrates. 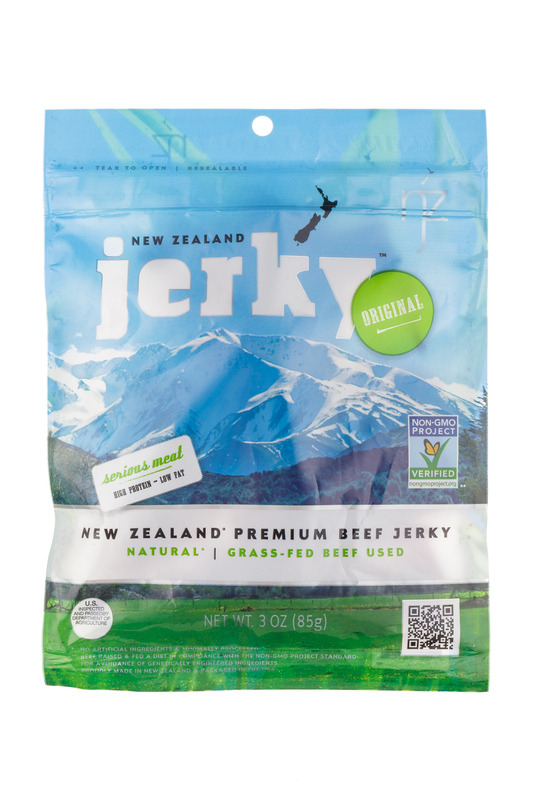 Cut into moist, tender bite-sized pieces for an unrivaled snacking experience, NZJ’s proud and caring crafts-people combine top quality, premium, non-GMO ingredients, in state-of-the-art manufacturing plants in New Zealand to deliver the U.S. consumers an option for the first Non Gmo Verified meat snack.